Read the full article at New York Daily News. 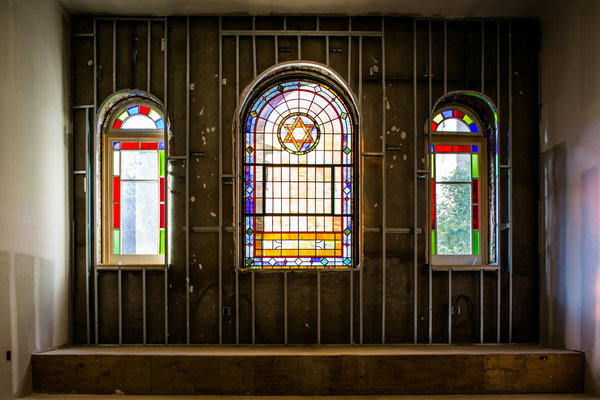 It’s not exactly money lenders in the temple, but a century-old East Village synagogue is being restored to its original glory thanks to a deal to let a developer build luxury condos on the upper floors. Q. Let’s talk about some of your projects, starting with two condominium buildings you’re working on in Fort Greene, Brooklyn. A. They have the same developer, East River Partners, but they’re two very different buildings. One faces South Portland Street, the other is South Oxford. We’re just outside the brownstone historic district. There’s a 60-foot-deep garden that connects the rear of the two. We have one building conceived to look like a large single residence with a mansard, and inside there are seven apartments. It’s a Federal style. Then, on the other side of South Portland Street, we adopted a different style: It’s designed more like a Parisian 1920s modern stucco building. It’s a more austere front and more modern in its styling and detailing. There are 16 units total. Brooklyn has a new high-tech arena, a new NBA basketball team and a popular three-star Michelin restaurant. Now it has a private equity fund dedicated to investing in the borough’s residential property. Manhattan-based developers East River Partners are raising a $25 million fund to target Brooklyn townhouses and midrise buildings, which it will gut renovate to convert these rental buildings into condos. So far the fund has raised about $10 million from wealthy individuals and acquired three buildings in Park Slope and Carroll Gardens for about $12 million. That includes about $7.8 million in debt. Each property will have five to 10 units with asking prices ranging from $800,000 to $1.8 million for two to three bedrooms. “It’s great time for people to buy in Brooklyn because rents are so strong right now and interest rates are low,” says Jody Kriss, one of East River’s co-founders. See the full interview on YouTube or The Stoler Report. ERP Principal, Joe Cohen, is interviewed by Michael Stoler on his television show, The Stoler Report: https://youtu.be/OwjoQsEUj5w. The episode, entitled “Developer’s Forum: Residential Development in the Region,” consists of an interview with Cohen, Doug Steiner (Steiner Equities), Mitchell Rutter (Essex Capital Partners), and Lester Petracca (Triangle Equities). Read the full article at New York Post or download the article. “It’s the only neighborhood left that’s quintessentially downtown,” says one of the project’s developers, Jody Kriss, of East River Partners, “and provides good value. Read the full article at New York Real Estate Journal or download the article. We currently have several residential condo conversions and rental projects under way in Brooklyn and Manhattan. We recently raised a discretionary fund – ERP Fund I – and are aggressively looking for $5-$50MM residential projects in NYC where we can rehab existing properties or develop ground-up. If you’re looking for a very boutique downtown condominium – we’re talking just three units – look no further than 415 E. Sixth St., a five-story project that begins sales later this fall. Closings started for the sold-out condominiums at a Park Slope conversion that Manhattan-based developer East River Partners gutted and renovated in 2012. The two and three bedroom condos at 371 Sixth Avenue were designed to lure Brooklyn families and went on the market in 2013. View the video at Real Estate Financial Intelligence. The availability of capital and who is providing it were the hot topics on REFI TV’s first-ever video roundtable. Co-hosted by Samantha Rowan, managing editor, and Billy Procida of Procida Funding & Advisors, guests Jody Kriss of East River Partners and Jim Wacht of Lee & Associates talked about the availability of capital for middle market transactions in New York, the emerging neighborhoods are in the city and if the city’s multifamily markets are overheated. East River Partners is laying down new-development tracks at a block-through compound just outside the historic district in Fort Greene. The developer, known for its conversions of Brooklyn brownstones, is planning two adjacent four-story buildings at 171 South Portland Avenue and 164 South Oxford Street. …the new owner is the developer East River Partners, known for turning brownstones into apartment buildings…the company has shown evidence elsewhere of good taste, and of respect for neighborhood aesthetic mores. That the two adjacent buildings planned for construction will be only four stories—and 50 feet tall—containing just seven units each, also bodes well for this brownstone and tree-lined Brooklyn street. Developer East River Partners, which specializes in converting townhouses in Brooklyn, is dabbling in new development with plans for two neighboring four-story residential properties in Fort Greene, Brooklyn. Multifamily Tuesday: Why Aren’t You Using the Jobs Act? The same people who converted 397 First Street in Park Slope into a condo—now sold out—have sent along a peek at their next project, another townhouse-to-condo transformation. That’s the exterior, above. This building has fewer offerings than its predecessor, with just four full-floor units, all two-bedrooms, two with outdoor space. (Too bad for the residents of the second and third floors.) Prices will range from $1.05 million to $1.8 million. Seems not too bad, though it’s hard to tell without floorplans. Read the full article at Mann Report or download the article. In 2010 Jody Kriss and his partner Joseph Cohen made a bold decision to be bullish on the condo market. It was a decision that has paid off. Together they started East River Partners, a New York based company that acquires and develops residential properties. To help finance the projects ERP set up a fully discretionary fund ERP Fund I. After years of failed development proposals by a tiny East 6th Street synagogue, its congregation has finally brokered a million-dollar lease deal to keep it afloat. The Congregation Adas Le Israel Anshei Meseritz has signed over the rights to its second floor to East River Partners LLC. Signage is up at 364 Union Street, a brownstone conversion project in Carroll Gardens. Sales will launch this spring, and the website is now up. There will be five condo units — four three-bedroom units and one garden duplex, with prices ranging from $1.15 to $1.6 million. Sales will launch this spring, and the website is now up. Over the fall a story came out about these developers, East River Partners, who buy up multi-families in Park Slope and Carroll Gardens and renovate them as small condo developments. So far they’ve had lots of success, with their units going at ask or above. Read the full article at Crain’s New York Business or download the article. People understand that with low interest rates and the way rents have gone up to extraordinary levels, it makes more sense to be a buyer than a renter right now,” said Joseph Cohen, a principal at East River Partners, which a few weeks ago began converting two small rental buildings in Brooklyn’s Carroll Gardens and Park Slope into condos. The residential market in New York City is facing extremely limited inventory with a citywide shortage that now exceeds 550,000 housing units. Despite the strong interest from buyers and renters, and interest rates that are at all-time lows, investors and builders in NYC simply cannot keep up with demand. For East River Partners LLC, this is an exciting time to be a real estate developer. Read the full article at REAlert.com or download the article. A fledgling investment shop is expected to close this month on $10 million of initial equity for its debut property fund. East River Partners of New York has set a $25 million overall goal for the multi-family vehicle, called ERP Fund 1. With leverage, the vehicle would have some $100 million of buying power. East River could boost that capacity by teaming up on transactions with partners. In Park Slope and Carroll Gardens, the Manhattan-based developer East River Partners is currently buying up and gut-renovating non-rent regulated multi-family buildings throughout the area. In the past year and a half, the firm has scooped up three multi-family buildings in Park Slope and one in Carroll Gardens. The company is in the process of transforming the buildings into 900- to 2,000-square-foot, two and three bedroom condominiums — units designed to lure Brooklyn’s Bugaboo stroller-pushing set. “Rents are so strong in Brooklyn now — and interest rates so low — that the monthly cost for our buyers of owning a home can be roughly half the cost or renting once they take into effect the deduction of interest from their taxes,” East Rivers Partners principal Jody Kriss said, explaining why the firm is intent on buying up and converting Brooklyn buildings. Read the full article or view our 397 1st Street case study. Over at 397 First Street in Park Slope, an eight-unit brownstone is well into the process of becoming an eight-unit condo. Developers East River Partners sent along some construction-in-progress shots of the building, which will include seven two-bedrooms and one duplex. Prices for the apartments, which are right across from P.S. 321, will range from $800,000 to $1.3 million, and a few of the brownstone’s original details, including stained glass windows and granite mantles, remain. The developers tell us they held a “design charette” with 15 area families to find out how to make the building as family-friendly as possible. What they came up with: tubs in the second bathrooms, to bathe small children, and non-toxic paint. The building also has a bike/stroller room, which seems to pretty well cover the neighborhood demographics. In a couple of weeks, a converted Park Slope building at 397 First Street, close to the corner of Sixth Avenue, will launch condo sales. While the building is still very much under gut renovation, it will have eight units: Seven two-bedrooms and one garden duplex. The asking prices will range from $829,000 to $1,279,000. Boutique residential developer East River Partners principal Joe Cohen tells us Brooklyn is the next frontier for family living. A condo owner might pay $4,200 annually in taxes in Park Slope, compared to $20k for a similarly valued home in Westchester. The schools in Brooklyn are top-notch, too, he says. It’s just that supply of two to three-bedroom condos hasn’t caught up. East River is developing eight condos at 1st Street and 6th Avenue across from PS 321 (sales will start in spring). At East River’s forum on condos, Brooklyn resident Sarah Mencher and others had some low-cost, family friendly suggestions for East River’s JR Benton and architect Len Herczeg, including ditching some luxury ideas: Don’t extend wood floors from the rest of the apartment to the kitchen; it’s easier to wipe spilled milk from stone. Deep bathtubs are a no-go, too. Other worthy add-ons: extra insulation in common walls (neighbors and crying babies don’t mix), rounded counters and handles, and a ground-floor parking lot for strollers.